In 1953, Undo and Jenny Sparachane purchased the Flamingo Club in Benwood, West Virginia, and in 1965, they added the Benwood Stag Bar to their list of entrepreneurial undertakings. Together, these two locations formed Undo's Famiglia Restaurant, a family-owned restaurant business that has specialized in Italian and American cuisine for over 50 years. 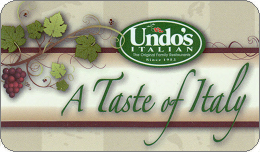 Undo's has extended to four, full-service restaurants within the Ohio Valley: Benwood, Elm Grove and Weirton, West Virginia and St. Clairsville, Ohio. For balance inquiries call the phone number to a Undo's Italian's location below.